The Ravenber Way is a 210 mile Long Distance Path, which travels through 2 National Parks and other areas of outstanding natural beauty as it crosses the country 'Coast to Coast' from the sleepy fishing village of Ravenglass on the Irish Sea to the attractive town of Berwick upon Tweed on the North Sea. The walk is the creation of Ron Scholes, a regular contributor to countryside programmes for BBC local radio and Outdoor magazines, and a long standing friend of Alfred Wainwright. Inspired by AW's entreaty in his 'A Coast to Coast Walk' for readers to "devise with the aid of maps their own cross-country marathons", Ron has done precisely that, crafting an excellent coast to coast journey of his own which plots a way across the country with several route options to take in its absolute finest scenery. Ron has named the route the Ravenber Way from its start and finishing towns and has produced a detailed and informative guidebook to the trail. 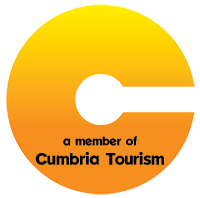 Prices are per person based on twin share and include all accommodation in twin share rooms on bed & breakfast basis, luggage transfer, information pack including Ron Scholes' guidebook & all required maps (worth over £110), plus our emergency contact. This is our recommended itinerary for the Ravenber Way, covering the whole route from Ravenglass on the Irish Sea coast to Berwick upon Tweed on the North Sea coast in 14 stages. This itinerary is suitable for experienced walkers who are happy with a daily mileage of around 15+ miles with the odd longer stage. Arrive at Ravenglass and check in. This itinerary for the Ravenber Way has an extra night in Boot in Eskdale from where it is possible to reach Wasdale via the high level option of crossing Scafell (England's second highest mountain). This option also has the advantage of a relatively easy warm-up day into a beautiful Lake District Valley. This itinerary for the Ravenber Way allows you to follow any of the three alternative high level routes between Eskdale and Langdale in the Lake District. This option also has an additional night in Boot and from there proceeds to Langdale by either the Three tarns, Esk Hause or Ore Gap and can include an ascent of Bowfell. Is also possible to tackle the Ravenber Way in two sections each taking a week. 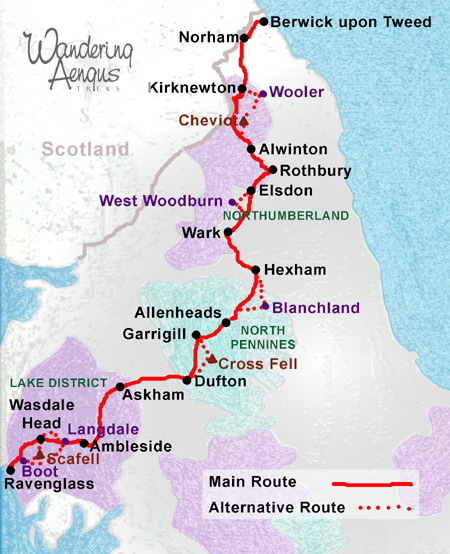 This Ravenber Way South Section traverses the Lake District and the North Pennines from Ravenglass to Hexham. The northern section of the Ravenber Way is less rugged than the southern, but there are some wild stretches of upland, not least of which are the Cheviots. This together with the slightly longer mileages make this half the equal of its partner in terms of challenge. A Wandering Aengus information pack containing all necessary maps and guide book (worth over £110), laminated locator maps for each night's accommodation, and our own weather-proof 'info cards' with local information - including locations and opening times of restaurants, cafes, ATMs, supermarkets etc. RAVENGLASS: There are trains to Ravenglass from London and Manchester via Preston or Lancaster and along the Cumbrian coast. Journey times from London are a little over 5 hours and from Manchester approximately 3 hours. Ravenglass can also be reached from Glasgow via Carlisle in approximately 3 hours. HEXHAM (Single week sections): There is a railway station in Hexham. There are trains to/from London (Kings Cross) via Newcastle (4 hours) or Manchester via Carlisle (3 hours). RETURN from BERWICK UPON TWEED: Berwick is on the main East Coast London to Edinburgh line. Trains to London are direct (3½ hours) or to Manchester via Newcastle or York (3½ hours). The Ravenber Way starts with your feet in the Irish Sea at Ravenglass. It passes through the finest scenery of the Lake District with options to take in some of the high summits and follows in the footsteps of the Roman legions along High Street. Crossing the pastoral Eden Valley it then keeps to the high ground of the Pennines, traversing the high moors into the ancient Kingdom of Northumbria. Beyond Hadrian's Wall it crosses the barrier of the Cheviot Hills before ending with a pleasant stroll through the leafy valley of the River Tyll and along the banks of the Tweed to reach Berwick-upon-Tweed, England's northernmost town.